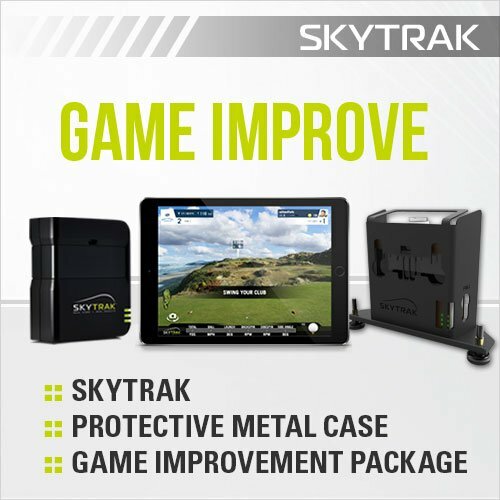 The first personal launch monitor of its kind, SkyTrak is a realistic and real-time golf practice and play system. Keep your golf game sharp with a SkyTrak Launch Monitor and Golf Simulator. This compact portable unit wirelessly connects to your compatible device and provides immediate shot launch data and ball flight visual feedback as soon as you hit the ball. SkyTrak accurately measures ball speed, launch angle, back spin, club speed, side spin, and side angle and displays carry distance, offline and total distance to simulate practice and play as if you were on the course or practice tee. Now integrated with four different Golf Course Simulation Partners: World Golf Tour, TruGolf E6, Jack Nicklaus Perfect Golf,and The Golf Club Game. Each functionality allows user to play at some of the world's top golf courses all from the comfort of home. Golf Course Simulation Partners require an additional fee on top of the SkyTrak Game Improvement Software Package. Open up a new world of game improving practice and hours of entertaining away from the course. Game Improvement Package includes: Longest Drive Contest, Closest to the Pin Contest, Target Practice, Skills Assessment, Custom Settings, 5 Camera Views, Session History and Progress Tracking, Charts and Graphs. SkyTrak requires compatible hardware and 3D graphics support - iOS: iPad Air, iPad Air 2, iPad Mini 2 (w/retina display), iPad Mini 3. PC: Windows 7, 8 or 10, Intel Core 2 Duo @ 2.0GHz or higher, 2GB RAM or higher. For more information go to www.skytrakgolf.com. Receiving your order requires a signature, someone needs to be home to sign for the package. Receiving your order requires a signature, someone needs to be home to sign for the package. If you have any questions about this product by SKY TRAK, contact us by completing and submitting the form below. If you are looking for a specif part number, please include it with your message.